Kids are not known for being neat and keeping their toys organized and put away (neither are most adults). 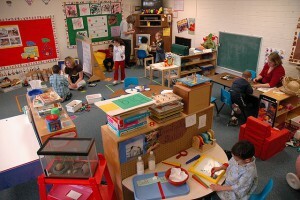 However, a clean, organized play space has many developmental benefits. While most homes will never look like a classroom, the key areas are great to implement at home. Notice how the room is divided into play areas with different themes, each area has toy storage, and the toys all have a specific place they belong. I found the key to doing this at home is finding good toy storage options (and using them consistently). I am not going to claim that my children actually put their toys away on their own yet, but we keep our play spaces organized as a family. Several times a day, we stop and all clean-up together (and about 1x/week I do a more thorough organizing with any children helping). We limit what toys are out to what is reasonably being played with, and there is the expectation to put away at least 1-2 other toys before a new bin can be taken out. Everything as a spot and even toddlers can easily learn where familiar toys belong. 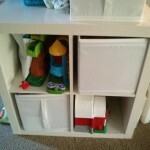 The key to making this work is that I have easy and adaptable toy storage in every play area. 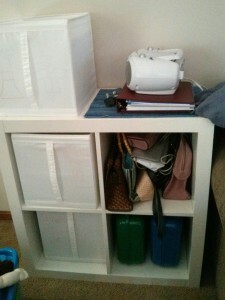 My favorite is the cube shelving from Ikea, with opaque bins to easily toss toys into. I prefer using the fabric bins because they have proven to be nearly indestructible, but light-weight enough for toddlers to pull out and move around. We also use a variety of other boxes, bins, and shelves, selected to fit each play area’s needs. Laundry baskets are also a sturdy and versatile option for larger toys. It is also helpful to make themed play areas for children. One room might have all the arts and crafts, while another is divided between construction and trains in one area and kitchen and dolls in another area. There might be special spaces with specific toys such as puzzles or an easel, such as in a parent’s office to use while a parent works. Safer and calmer play areas to promote attention to play. Gives structure to play time (and most children need structure!). Teaches children to slow down and think about what they want to play, rather than impulsively jumping from activity to activity. Promotes responsibility to take care of belongings. When toys are out of sight, they feel newer and more exciting when they are taken out. For example, when I need to have 10 minutes to do a chore, I pull out a bin that hasn’t been used today and dump it on the floor, and both my toddler and preschooler rush over and play as if they haven’t seen the toy in weeks. It allows parental control over certain bins that can be stored out of reach. We call it “I need help” box, which holds toys that need adult supervision.